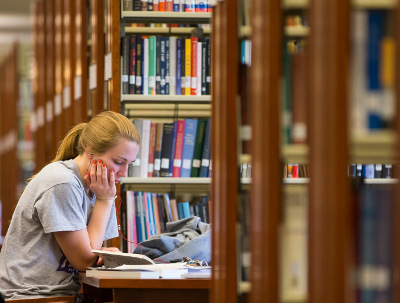 Why are our libraries among the top ranked in the nation for student satisfaction? We seek to engage, enlighten, and empower our students and provide them with the resources and services to excel in their studies. Whether you're researching the work of a 19th century artist or seeking the latest finding in a cell biology journal, Furman's library system can help. Our friendly and knowledgeable librarians are devoted to student learning and research support. They can help navigate our collection of more than one million resources, including books, e-books, journals, films, music, images and electronic databases. The centerpiece of the library system is the James B. Duke Library, which provides access to over a million physical and online resources and to a variety of academic information services and technologies. Take advantage of our Special Collections to find unique historical documents, photographs and artifacts or browse for digital versions of some of these resources through the Digital Collections Center. If you’re looking for specialized libraries located closer to your classes, visit the Sanders Science Library or the Maxwell Music Library. With so many options available, it’s no surprise that our libraries are a frequent destination for studying, meeting friends, conducting research, and enjoying campus events.